A large copy of the Holy Quran in Kufic script is on show at the pavilion of Turkey’s Hizmat Publication in the Tehran International Quran Exhibition. Ali Nodehi, in charge of the pavilion, said the copy is one of the 500 printed in 2007 to be gifted to heads of Muslim countries. 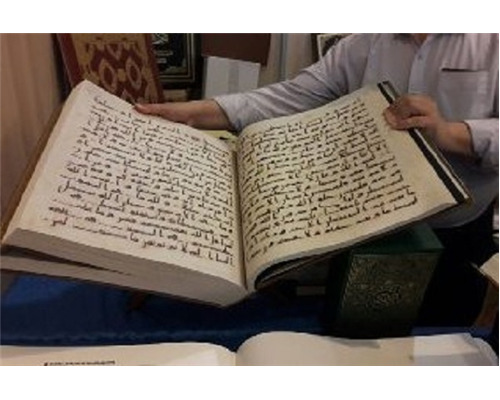 Weighing about 16 kilograms, it is the printed copy of the first Quran in Kufic script, which is kept in a museum in Istanbul, he noted. The pavilion has also displayed other rare copies of the Quran and Quranic calligraphy works by prominent Turkish calligraphers. The 25th edition of the Tehran International Quran Exhibition kicked off on Monday. The Iranian capital city’s Imam Khomeini (RA) Mosalla is hosting the event. The exhibition, whose motto is "Quran, Ethics and Life”, will be underway until June 16.